If you go to sell your home today and find buyers will pay you less than they would have last year, would you say real estate values are rising or falling? If you go to buy a home, and your lender says you can afford to buy a more expensive home due to falling interest rates, does this mean you'll be willing to give a seller more than his home is worth? I mean, just because you can spend more does not mean that you'll just pay more money for the same house, right? Do these questions seem stupid? These two questions (I believe) clearly indicate why there is a debate about real estate values and real estate depreciation. Some real estate agents look at the average sales price of homes over time, and if it is going up, they say real estate values are rising. But I say there is a huge difference between prices and values. Right now, historically low interest rates are allowing buyers to spend more for a home, without raising their monthly mortgage payment. This has made them more powerful shoppers and they now have a wonderful choice. They can either buy a home they planned on buying (with a lower monthly mortgage payment), or they can buy a "better" home and keep their monthly payment the same. Were you to only track the change in the average sales price in a market, then you might wrongly conclude that "real estate values" are rising, when in fact only the average sales price is rising. 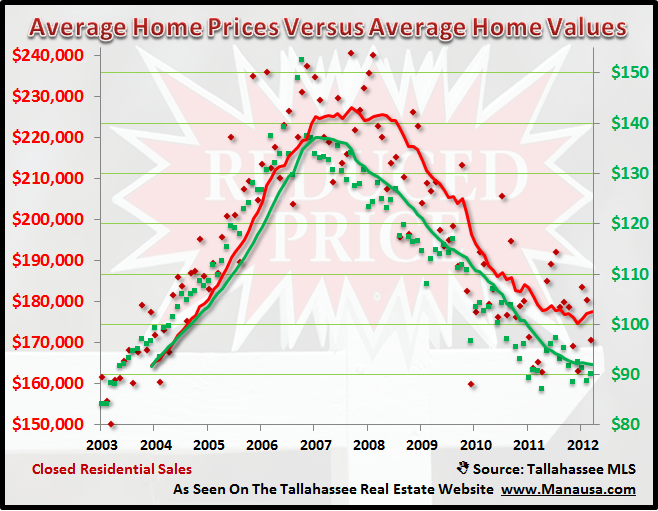 The following real estate graph shows the difference between real estate values and real estate prices in Tallahassee since the beginning of 2003. Note how they move in a similar manner, but there are many times when prices fluctuate and values do not. I believe this reflects changes in the spending pattern of buyers which appears in prices, but has no impact on real estate values. The real estate graph above shows that real estate values have been on a steady decline since 2006. We also know that the real estate supply and demand dynamic in Tallahassee still is heavily weighted towards the buyer, thus pressure on real estate values will remain until we see "equilibrium" return between the number of homes for sale in Tallahassee, and the number of buyers for Tallahassee homes. So, if you are thinking about selling a home, just drop me a note and we can schedule a time to determine if current real estate values are right for you to sell. Sentiments are invalid if there is no chart to prove that they were right. For now real estate is steadily recovering.